Introduction to Musicals: "The Music Man"
Four pages of questions students can answer as they watch The Music Man. Questions help the students focus on the characters and the music as they watch the video. The Music Man is a classic musical, accessible to all ages and a great introduction to the wonderful world of musicals. This lesson is intended to introduce students to the musical as they prepare to watch the 1962 film version or see the show performed live. LET'S GO TO A BROADWAY SHOW: THE MUSIC MAN MOVIE GUIDE-"BACK TO SCHOOL"
"THE MUSIC MAN" WORD SEARCH! GREAT "BACK TO SCHOOL" ACTIVITY! 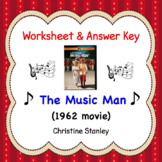 30 questions (with answer key) to help your middle or high schoolers focus as they watch "The Music Man" (1962). 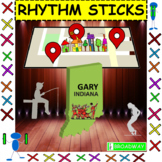 A perfect resource for last-minute substitute plans, or a unit on musicals. This is a great worksheet to have in your sub-tub. It goes along with the Music Man from 1962. The students can fill it out while watching the movie. 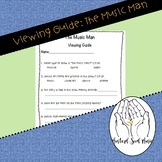 This 20 question, multiple choice quiz is based on the 2003 TV Movie, "The Music Man." Questions about Songs in The Music Man. While watching the music man students can fill out simple questions that go along with the story line.